The Graves Light Station was completed in 1905 on the rocky ledges known as The Graves at the outer limits of Boston Harbor. The ledges were named for Thomas Graves, vice-admiral of John Winthrop's fleet and a prominent early trader in colonial Massachusetts. 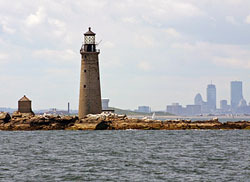 The Broad Sound Channel, a shipping channel into Boston Harbor, opened in the early 20th century and necessitated the construction of a new light station at The Graves. Lighthouse builder Royal Luther supervised the construction. 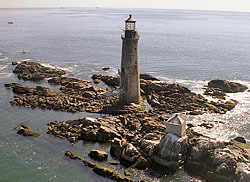 The design of Graves Light is very similar to Maine's Ram Island Ledge Light, built at about the same time. The five-story, 113-foot tall tower is constructed of granite blocks cut at Rockport, Massachusetts, and transported by steamer to the site. A 40-foot high ladder ascends from the base of the tower to the entrance. The first story was used as storage space; the second story was the engine room and contained the fog signal equipment; and the third story was the kitchen. The keepers lived on the fourth and fifth stories. A water cistern was located in the base of the tower. The original first-order Fresnel lens was lit on September 1, 1905, and emitted a light of approximately 380,000 candlepower. Later intensified to 3.2 million candlepower, the light served as New England's most powerful light for many years. Upon automation in 1976, the original Fresnel lens was replaced by a modern optic. A severe storm destroyed the fog signal building in 1991, but the original oil house is still standing. The Graves Light is closed to the public and best viewed by boat, although distant views are obtained from the towns of Winthrop, Nahant and Hull. Graves Light Station is located on The Graves, and is owned and maintained by the U.S. Coast Guard as an active aid to navigation. The island and the light station are closed to the public. The Graves is one of 34 islands comprising Boston Harbor Islands National Recreation Area, which is managed by a 13-member partnership that includes the National Park Service and other public and private organizations. The tiny island is adjacent to the Boston North Channel east of Winthrop.